My Life. My Choice. My Education. Are You Using Social Media or Being Used By It? Are We Going to Allow Smartphones to Destroy a Generation? The problem with a lot of the advice that teenagers and their families get about higher education debt is that it’s totally, utterly bloodless. The federal Department of Education takes its shot in its role as the de facto provider of advice to people borrowing their first federal student loans and repaying them. That counseling is mandatory for borrowers, but because the topic is dense and the department’s content is devoid of anecdotes, it’s tough to make the lessons stick. So in my column last week, I asked readers to share their own stories and offer the most important thing they wish they had known before they borrowed money and began to repay it. The comments painted a troubling picture of clueless teenagers, frazzled parents and college administrators who may not always take students by the shoulders and question their debt levels. Not one person suggested that college was a mistake (though a few regret going to law school). Borrowing too little is dangerous if it leads to dropping out or never attending in the first place, and undergraduates who borrow from the federal government without taking on additional private loans are unlikely to get in trouble if they manage the repayment process well. Tim Ranzetta’s handwritten list of his “financial situation,” made in 1983 when he was 16 and contemplating college. THE LIST As the fifth child in his family, Tim Ranzetta already knew the deal. His family income was too high to receive any need-based financial aid. His parents might put aside some money for college when the income tax refund arrived each April, but they weren’t going to be writing any checks once he enrolled. 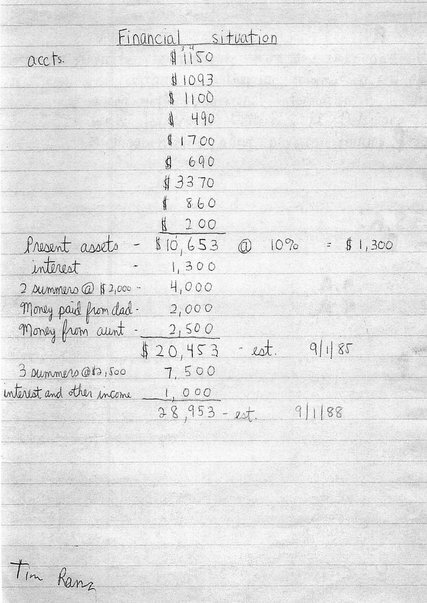 So at the age of 16, he sat down and made a list that summed up his savings and his overall “financial situation.” The year was 1983 and it required no computers or graph paper, just basic awareness about money that every child should have by that age but that far too many do not. If your teenagers have no idea what you have saved or can afford to pay, tell them. Even if college is a few years away, start explaining the financial aid and loan system to them now so that they are capable of plotting out their own situation. You don’t want their introduction to personal finance to begin when they confront their first confusing financial aid “award” letter and the five-figure bill that arrives later. Mr. Ranzetta now runs a nonprofit group called Next Gen Personal Finance, where he helps teachers who are looking for better ways to teach their students about money. I particularly like his online collection of videos and documentaries about student loans, which can serve as a sort of family movie fright night a year or two before applying for college. THE COUNSELING Mr. Ranzetta sees no reason the federal government cannot require that people who borrow money from private lenders like Sallie Mae undergo mandatory counseling the same way that federal student loan borrowers do. Federal law makes it difficult for people to discharge student loans in bankruptcy court and private lenders benefit greatly from this restriction. Auto lenders and credit card companies don’t have that same privilege. So why not require a separate counseling session for private loan borrowers, who may not immediately grasp the distinctions between that kind of debt and any loans that come directly from the government? Alfred MacDonald, a 26-year-old graduate of Trinity University in San Antonio and a resident of that city, suggested making it crystal clear that private loans do not come with the same guarantee of flexibility as federal loans, with their income-driven repayment options. THE COURSE Many teenagers come from families where parents don’t have the knowledge, time or English-speaking skills to teach their children about the financial aid system. So Ben Lindsey, 27, who graduated from Oklahoma Christian University with about $100,000 in student loan debt, said he wished that colleges would require all new students to take a basic course about money that forced them to run their overall loan projections at the beginning of their first year. It’s tempting to denounce the small percentage of the indebted who have this much debt and say that they should have known better. And Mr. Lindsey isn’t looking to point fingers or evade responsibility. Plus, college was great for him in many respects — he met his wife and has a good job in the commercial loan field in Oklahoma City, far from the shakier economy in his native Delaware. THE CHECKUP The one complaint that I heard repeatedly was this one: Given the hopscotch manner in which students take on debt each year, loan by loan, it is much too easy to lose track of your running total. Shannon Doyle, a financial counselor with Lutheran Social Service in Minneapolis, says families often come into her office with no idea how much a student owes and with mistaken ideas about how parent loans can be combined with student loans after graduation. She advises students and families to keep score on three pages of a spreadsheet that they update each term. The first one should have federal student loans, divided into subsidized ones (where the government covers the interest while the student is enrolled) and unsubsidized ones (where the interest accrues during school). The second page is for private loans, if any, from entities like Sallie Mae, and the third is for any loans the parents take out themselves. Sites like tuition.io can help with this sorting task. My conversations with Ms. Doyle ended with a plea of sorts to the schools: Please, do your best to provide a running total of debt on the financial aid statements you send out each year. “There should be no barriers to students knowing how much they have borrowed,” she said. 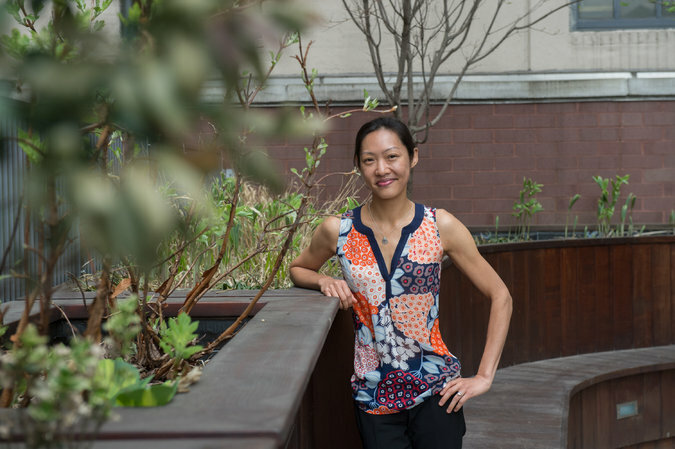 THE DAILY INTEREST Before Kim Liao’s enrollment at Georgetown, the story of her family had been one of downward mobility. Her father had died, the family had struggled and there was pressure on her to work part time as an undergraduate — not to pay her way but to send money home. She considers herself lucky to have graduated with just $22,500 in student loan debt in 2006, but that didn’t sit well with her. What really flipped the switch in her head was when a phone representative at her loan servicer told her that she would be paying $2.23 in interest each day. “So you start out with zero dollars to your name, and you’re going negative by that amount every single day,” she said. A guide to student loans at various universities, and what it takes after graduation to repay that debt. How Much Student Loan Debt Should Parents Take On? Chances are you know some college graduates with student loan debt. Perhaps you’re one of them. It’s always better to be the lender than it is to be the borrower, and this is especially true when it comes to student loans.Many types of student loans simply don’t go away until they’re paid. This includes student loans parents take for their children. But first, let’s explore if it makes sense for you to pay your child’s way through college. If you’re financially unstable, should you really plan to pay for your children’s college education? No, of course not! At least not until you get your financial priorities straight and have the means to pay for their education. That means: Set priorities. I recommend having a solid emergency fund and your retirement strategy in place before you even think about paying for your children’s college educations. It’s also a good idea to make sure you have adequate life insurance in place and an estate plan as well. Don’t start paying for your children’s college education until you accomplish these foundational financial goals. Education is an investment. Like any investment, before you invest, you should do your homework as a parent to determine if you and your child will get a good return on investment (ROI). Here are some things to consider. Not all colleges are created equal. Does your child want to go to a low-cost community college or an expensive Ivy League institution? Not all college degrees are created equal. An engineering degree may have a better ROI than other degrees. Keep this in mind, but also understand that your student may plan on graduating with one major, decide to change course when they get to college, and end up graduating in another field. Not all children want or need a college degree. Some children will benefit from a college education while other children may do better off starting their own business after high school, going to a trade school or pursuing a different dream. These are just a few of the factors you’ll want to consider to determine if you should pay for your children’s education. One thing is certain: Paying for your child’s education without any information about their goals and expectations can be disastrous for your finances. Consider the benefits of their proposed college plan – or lack thereof – before you sign on the dotted line for student loans or pay out of pocket. That leads us to the main question at hand: How much student loan debt should parents take on? How Much Student Loan Debt Should You Incur for Your Children? I absolutely love my children. Like any good parent, I want to ensure my children get the education they need. At the same time, I would want to avoid taking out student loans. It would be my very last resort. I don’t know about you, but I’ve heard plenty of horror stories about kids who got their parents to sign on the dotted line only to not use their education and waste their life away. Imagine being stuck with a hefty student loan that didn’t do anything for your kid’s future. Doesn’t that make your stomach flip? So, how much student loan debt should parents take on? I recommend none. There are plenty of other options out there that can help you fund your children’s college education. And I’m not the only money pro or parent who shares that opinion. None. A parent should not take out student loans for their kids. What if you’re a parent who hasn’t saved for your child’s college education and they are about to graduate high school and want to go to college? What if the college they want to go to would probably provide a good return for your investment? What if you don’t have very much debt and reasonably believe that your child should go to college? What then? As a parent who hasn’t had a whole lot of time to save up for my child’s college education, I think if parents want to take on debt to help their kid with college costs, that’s fine – but only if the parents are comfortable with it and it’s only an amount that the parents can easily fit into their budget. It’s always unfortunate when parents start saving a little too late, but even in those circumstances, it may make sense for them to take out loans for their kids – as a last resort. In an ideal world, my answer would be none, but unfortunately here in the real world things aren’t always so simple. We took out (relatively small) loans for two sons because we had no college fund, and it was either that or they would have had to drop out of school. So I guess my answer would be as little as possible, and never more than they can reasonably expect to be able to repay. I’m a fan of saving for my children’s college education, and that’s what I encourage you to do, too. You might be tempted to open a simple savings account for your children’s education. But unfortunately, over the course of 18 years (or however long you have left before your children enter college), your money almost certainly won’t keep up with the cost of college and inflation. Look up tuition inflation on your favorite search engine, and you’ll find that it profoundly exceeds general inflation. Historically, economic data shows that trailing averages for tuition inflation has ranged between about 5% and 9% from 1975 to 2005. I don’t know about you, but I’d hate to see my funds eaten away by any kind of inflation. That’s why I invest money using 529 plans in my state so that I can get a return on my money and hopefully offset the negative effects of inflation. A 529 plan is one that allows parents to set aside money in investments for their children. And, it’s my plan of choice. These plans usually contain mutual funds and their specific details vary from state to state. Look at what your state offers and make sure the investments within your state’s plan makes sense for your situation. Oh, and did I mention this is a tax-advantaged option? This fact alone makes the 529 plan a great choice. Should you pay for your children’s entire education? Perhaps. Perhaps not. There are so many scholarships available out there it’s mind-boggling. Don’t let your child miss out on this opportunity to save mom and pop some money. Also, if your child fills out a FAFSA (Free Application for Federal Student Aid), they may be eligible for federal grants that can save you and your child a truckload of money. It is best to allow your children to be fully responsible for any student loans they incur. Sometimes, students can get more financial aid (in the form of loans) if their parents put their names on the line for the loans. However, you should consider other routes if possible. Signing on for student loans will tie them to your credit, and if you or your children have difficulty making the payments, it could damage your credit. If you’ve already taken out student loans for your child, then it’s important to check your credit regularly to see how the debt is affecting it. You can get a free credit report summary on Credit.com, which is updated monthly so you can watch for changes and get an overview of all the factors in your credit report. Again, the very best thing you can do is to prepare for funding at least a portion of your children’s education long before they graduate high school. If this isn’t possible, and having your children attend college makes sense, help your children out as you’re able. I can’t think of any better education for high school graduates than learning the value of hard work, determination, creativity, kindness and common sense. Teach your children these ideals, and who knows, they might just graduate with no debt whatsoever! This story is an Op/Ed contribution to Credit.com and does not necessarily represent the views of the company or its partners. Jeff Rose, Certified Financial Planner and Iraqi combat veteran, is the CEO of Alliance Wealth Management, LLC. He is the author of Soldier of Finance and editor of GoodFinancialCents.com and LifeInsurancebyJeff.com. 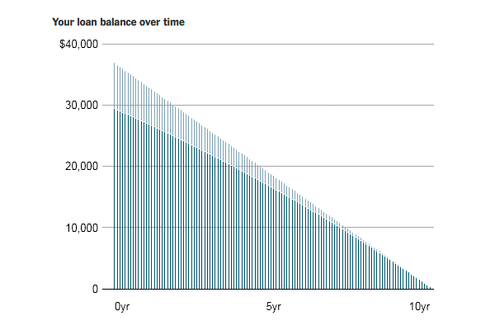 Take stock of existing student debt, but don’t delay starting to save for the next generation. ​Lucy Knutson​ says she was fortunate because her parents helped pay for her undergraduate education. But when she decided to go to law school, she had to foot the bill, and she graduated with more than $100,000 in loans.Now that she’s a mom of two, she and her husband automatically put money from their paychecks toward college savings accounts for their almost 4-year-old daughter and 4-month-old son. “If they want to go to college, I don’t want them to have to worry about the financial implications,” says the 33-year-old​, who lives in the San Diego area. Still, reducing her student loan debt is a high priority for the Knutsons, and they recently took out a loan against their 401(k) retirement plan to pay off the student debt faster and at a lower interest rate. More and more parents are being pulled by a financial tug-of-war: They want to start college savings for their children but are still burdened with lingering student debt of their own. About 40 million Americans have at least one student loan to repay, according to an analysis from credit bureau Experian. There are some strategies that allow savers to do both. 1. Take stock of your debt: Parents need to understand what types of student loans they have: private or federal. The cost and repayment options can be quite different, Jarvis says.Federal student loans tend to be more flexible and have unique consumer protections, such as disability and death discharge provisions, opportunities to postpone or reduce payments, and repayment options that are tied to income. Jarvis suggests making a full list of your loans – both private and federal – and their interest rates. To look up federal financial loans, go to the National Student Loan Data System for Students website or Studentloans.gov. To get a list of all your student loans, including private ones, get a free copy of your credit report from annualcreditreport.com. 2. Consider debt interest rates: If you have student debt at a high interest rate, focus on paying off debt more aggressively, Jarvis says. Some people are paying interest as high as 8.5 percent for federal loans, while private loans can be between 15 and 18 percent, Jarvis says. However, borrowers with student loans at lower interest rates could take a slow and steady approach to paying off loans while also focusing on savings. Gopaul says she sees her clients get caught up in other priorities and never start saving for college. And while having an emergency fund is most important, it’s also relatively easy to open a college savings account with a low minimum. 4. Make college savings automatic and funnel surpluses there: Gopaul says she’s a big fan of 529 plans, which are tax-advantaged college savings accounts, because parents can set them up so that money is automatically deducted from a paycheck or checking account. She also likes the fact that parents “can’t touch” money in those accounts because there’s a penalty if you don’t use it for education. If borrowers get a tax refund or a raise, she suggests using a portion of the money for college savings and putting some of the money toward paying down debt. Deborah Ziff is a Chicago area-based freelance education reporter for U.S. News, covering college savings and 529 plans. You can follow her on Twitter. These website terms and conditions were made using a Contractology template. Unless otherwise stated, MyColLife and/or its licensors own the intellectual property rights in the website and material on the website. Subject to the license below, all these intellectual property rights are reserved. You must not: • Republish material from this website (including republication on another website); • Sell, rent or sub-license material from the website;• Show any material from the website in public;• Reproduce, duplicate, copy or otherwise exploit material on this website for a commercial purpose;• Edit or otherwise modify any material on the website;• Redistribute material from this website, except for content specifically and expressly made available for redistribution. You must not use this website in any way that causes, or may cause, damage to the website or impairment of the availability or accessibility of the website; or in any way which is unlawful, illegal, fraudulent or harmful, or in connection with any unlawful, illegal, fraudulent or harmful purpose or activity. You must not use this website to copy, store, host, transmit, send, use, publish or distribute any material which consists of (or is linked to) any spyware, computer virus, Trojan horse, worm, keystroke logger, rootkit or other malicious computer software. You must not conduct any systematic or automated data collection activities (including without limitation scraping, data mining, data extraction and data harvesting) on or in relation to this website without MyColLife's express written consent. You must not use this website for any purposes related to marketing without MyColLife's express written consent. Access to certain areas of this website is restricted. MyColLife reserves the right to restrict access to other areas of this website, or indeed this entire website, at MyColLife's discretion. If MyColLife provides you with a user ID and password to enable you to access restricted areas of this website or other content or services, you must ensure that the user ID and password are kept confidential. MyColLife may disable your user ID and password in MyColLife's sole discretion without notice or explanation. You grant to MyColLife a worldwide, irrevocable, non-exclusive, royalty-free license to use, reproduce, adapt, publish, translate and distribute your user content in any existing or future media. You also grant to MyColLife the right to sub-license these rights, and the right to bring an action for infringement of these rights. Your user content must not be illegal or unlawful, must not infringe any third party's legal rights, and must not be capable of giving rise to legal action whether against you or MyColLife or a third party (in each case under any applicable law). Notwithstanding MyColLife's rights under these terms and conditions in relation to user content, MyColLife does not undertake to monitor the submission of such content to, or the publication of such content on, this website. This website is provided “as is” without any representations or warranties, express or implied. MyColLife makes no representations or warranties in relation to this website or the information and materials provided on this website. These limitations of liability apply even if MyColLife has been expressly advised of the potential loss. • matter which it would be illegal or unlawful for MyColLife to exclude or limit, or to attempt or purport to exclude or limit, its liability. You accept that, as a limited liability entity, MyColLife has an interest in limiting the personal liability of its officers and employees. You agree that you will not bring any claim personally against MyColLife's officers or employees in respect of any losses you suffer in connection with the website. Without prejudice to the foregoing paragraph, you agree that the limitations of warranties and liability set out in this website disclaimer will protect MyColLife officers, employees, agents, subsidiaries, successors, assigns and sub-contractors as well as MyColLife. You hereby indemnify MyColLife and undertake to keep MYColLife indemnified against any losses, damages, costs, liabilities and expenses (including without limitation legal expenses and any amounts paid by MyColLife to a third party in settlement of a claim or dispute on the advice of MyColLife's legal advisers) incurred or suffered by MyColLife arising out of any breach by you of any provision of these terms and conditions, or arising out of any claim that you have breached any provision of these terms and conditions. Without prejudice to MyColLife's other rights under these terms and conditions, if you breach these terms and conditions in any way, MyColLife may take such action as MyColLife deems appropriate to deal with the breach, including suspending your access to the website, prohibiting you from accessing the website, blocking computers using your IP address from accessing the website, contacting your internet service provider to request that they block your access to the website and/or bringing court proceedings against you. MYColLife may revise these terms and conditions from time-to-time. Revised terms and conditions will apply to the use of this website from the date of the publication of the revised terms and conditions on this website. Please check this page regularly to ensure you are familiar with the current version. MyColLife may transfer, sub-contract or otherwise deal with MyColLife's rights and/or obligations under these terms and conditions without notifying you or obtaining your consent. We collect information from you when you register on our site, respond to a survey or fill out a form. When ordering or registering on our site, as appropriate, you may be asked to enter your name or e-mail address. Visiting MyColLife.com anonymously is prohibited.